Chicken salad is a long time frugal basic. The thing is though, not too many people make it any more, especially not from scratch. So if you’ve never made it, or haven’t made it in a long time–you’re in for a treat. I use bargain priced chicken breasts that are $2 per pound. The entire recipe, which makes a whopping 10-servings for normal appetites, costs about $5 total. That means each serving is 50¢. If you’re crew is made up of starving teenagers and construction workers, the recipe will still make 6-hearty servings, for less than $1 each. If you scroll down you’ll see the variation for Cranberry Chicken Salad. For reasons I don’t begin to understand, this variation is more popular than anything this cheap has a right to be. I brought it to a potluck one time and over a dozen people asked for the recipe. Now people actually request that I bring my Cranberry Chicken Salad because it’s just that popular. I admit that it does taste good, but I don’t understand why it’s as popular as it has become. 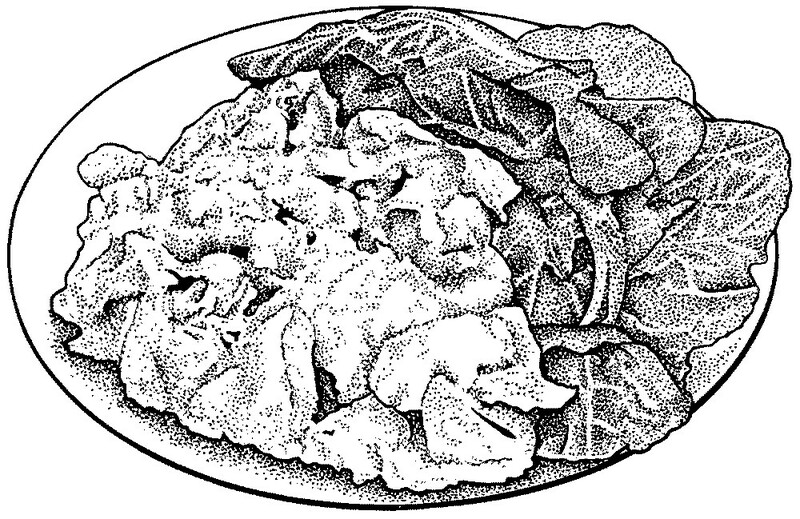 Maybe nobody makes chicken salad from scratch anymore, so it seems novel and homey. I’m not really sure. What I do know, is that if you want to really wow your guests, Cranberry Chicken Salad is a proven way to do it. First thaw the chicken breasts. When they are mostly thawed place them in a saucepan and cover them with water. Simmer the chicken breasts on the stove for 30 to 40 minutes, or until they are no longer pink in the center. Smaller chicken breasts may be cooked in less time. Larger ones require longer cooking. Cut them in half if you want them to cook faster. Remove the chicken from the water. The water is now chicken broth. Store it in the fridge for making soup and sauces. Place the chicken into the fridge to cool. It will take about 20-minutes or so. Meanwhile wash and chop your vegetables. For chicken salad it works best if you chop the vegetables into small bits. Everyone always asks me why my chicken salad is so good, and I think this is the “secret ingredient.” I cut each celery rib into 3 long, thin pieces and then chop it. The onion I just keep chopping at until it’s smaller the celery. Place the chopped veggies in a medium-large mixing bowl. Add 1-cup of mayonnaise and the black pepper. Mix it up. Next take the cooled chicken out of the fridge and chop it into small bits too. They can be bigger than the celery, but you still want it somewhat small so it’s easy to chew. Add the chicken to the bowl of mayonnaise and veggies. Stir it up. If it seems dry then add a little more mayonnaise, until it’s the consistency you prefer. Mix well so everything is evenly moistened with the mayo. Transfer the chicken salad to a resealable container. Chill for at least a couple of hours, or overnight is better. Serve on a bed of salad greens or spread on rice cakes or use for sandwiches. Makes 5 to 6 cups, or about 10 servings; 1/2-cup each. Per Serving: 198 Calories; 9g Fat (42.7% calories from fat); 21g Protein; 8g Carbohydrate; trace Dietary Fiber; 68mg Cholesterol; 238mg Sodium. Exchanges: 3 Lean Meat; 1/2 Vegetable; 1-1/2 Fat; 1/2 Other Carbohydrates. Simply add 1-cup of dried cranberries (Craisins) to the chicken salad. You’ll probably need the full 1-1/2 cups of mayonnaise. Stir it up and chill until needed. It tastes best if allowed to chill overnight. 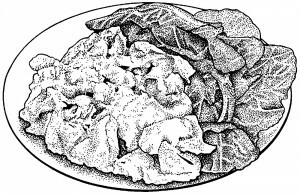 This is such a simply addition to the chicken salad, but people think it is some kind of gourmet treat. The cranberries make the salad especially pretty to look at, especially when it’s on a bed of pretty salad greens. Add a few cucumber slices and maybe some tomato wedges to make it really fancy. Or for a cheaper alternative, just eat it over a bowl of shredded cabbage. If you want a dish for summer potlucks and want to really wow the other folks, this is a great dish to use. It’s easy, make-ahead, and for reasons I don’t really understand, people think it’s something special. Makes 12-servings, or about 6-cups. Assuming 1/2-cup per serving. 1-1/2 cups Light Mayo and 1-cup of dried, sweetened cranberries. Per Serving: 198 Calories; 8g Fat (35.5% calories from fat); 17g Protein; 15g Carbohydrate; 1g Dietary Fiber; 57mg Cholesterol; 198mg Sodium. Exchanges: 2-1/2 Lean Meat; 1/2 Fruit; 1 Fat; 1/2 Other Carbohydrates. I like to add grapes or walnuts or both to this recipe. This makes the entire recipe huge. I have never tried dried cranberries before. I will try this next time. Sounds delicious. It is surprisingly good Patricia. I’ve done it with grapes too, and I agree, that’s a classic. I’ve also added curry powder or chopped chipotles peppers, both are tasty. It’s a great basic recipe to adapt as desired. Thanks for sharing your tips ?